Before coming in to this weekend, I was excited, but not THAT excited. 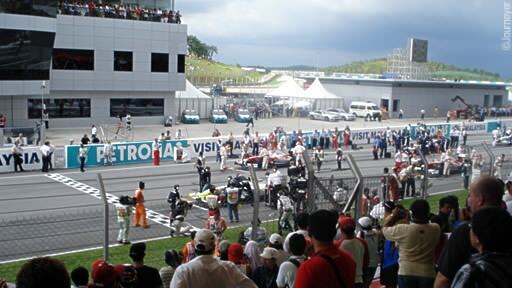 The Malaysian Grand Prix had produced some good races, but had also produced some boring ones as well. The fact that the first race I attended was at Singapore last year set the bar pretty high for me. Surely, there was no way that could be beaten. I was wrong. Yet I was also right. Confused? Read on. 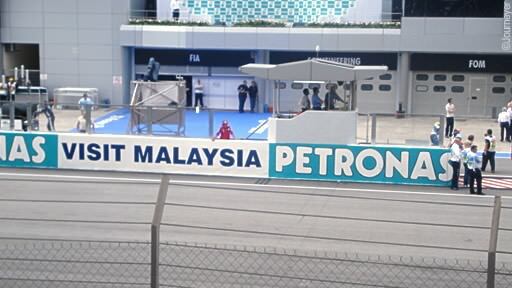 It was our first time going to the circuit, and the package we got (available from the Sepang website) was interesting. We took a monorail from the hotel to KL Sentral Train Station. From there, we took a Transit train to KL International Airport (KLIA). From there, a shuttle bus would meet us and take us to the outside of the circuit. From there, we'd switch to another bus that would take us to the gate. Once off the bus, it's a one-kilometre walk through the gates and to our stands. It was tiring at first, but you get used to it. The two free practice sessions were on offer that day. 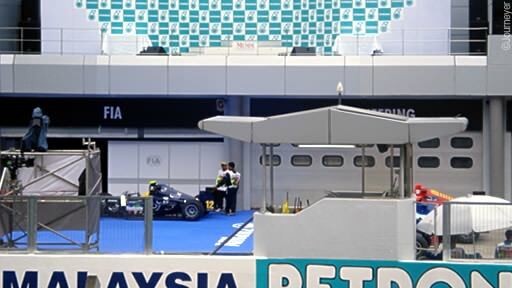 In an effort to attract more people to the circuit, the Sepang organizers decided to open it to the public for free. Did it help with the crowd? Perhaps a little, perhaps not - most of the people I saw on Friday also showed up on Saturday and Sunday. But it did allow us to sit where we want. My mom and my sister went with me and my dad that day - they weren't going to watch for the rest of the weekend. Yup, the front of the Brawn garage. It was quite interesting how they went about their work. They didn't care about how cramped their space was or how far away their garage was from parc ferme. All that mattered was that they thought they had the fastest car that weekend - and time would tell if they were right. Another new feature of race weekends this year was the 'mandatory' autograph session. I say 'mandatory' because I encountered a couple of big issues with it. The first one was on Friday morning - I lined up for the Williams session. We were hoping to get Nico's signature at least - perhaps both him and Kazuki if we were lucky! Then the Williams drivers came... well, driver. Only Kazuki showed up - Nico got pulled from the line-up since he wasn't done yet with his debrief, according to the emcee on stage. So much for mandatory, then. It left us disappointed, but we weren't going to waste our spot in line - we got Kazuki's autograph. Some of the others decided to skip Williams altogether and formed their own line for McLaren, who came later in the afternoon. I decided to go with Kazuki, thinking Lewis might not show up, especially after it was announced that McLaren only decided to go with the session at the last minute. 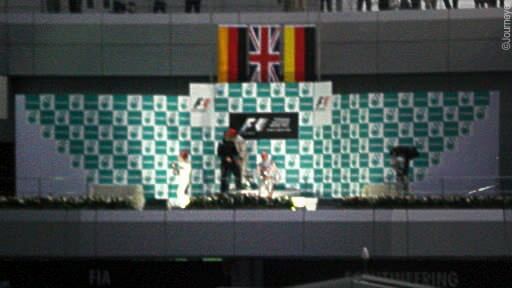 As it turned out, Lewis did show up, but I didn't mind too much - was never really much of a McLaren fan, anyway. 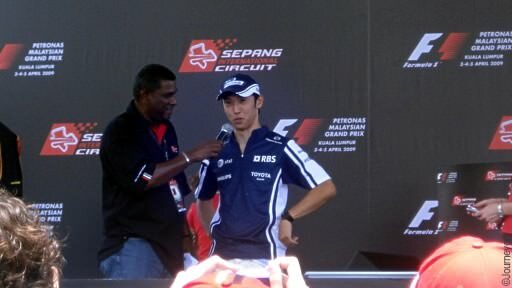 On our way home from Sepang, we heard about Lewis' press conference and apology regarding Australia. Lewis was profusely apologizing, but I would've wanted to hear from Davy Ryan too. Martin Whitmarsh's run as team principal at McLaren is slowly descending into total chaos, it seems. It's hard to tell whether the bigger problem is their car or their reputation. My dad and I met up with a friend of ours that day who was also going to watch the race. It was a trouble-free ride to the circuit, everything going rather smoothly. What we did notice that morning, though, was just how hot it was - and I'm from a tropical country! But I was lining up for autographs again, this time for Ferrari, so I just grinned and bore the heat. But I was only to be disappointed - again. Kimi and Felipe both showed up - but they came five minutes late and left five minutes early. There were people in front of us who had lined up for two and a half hours, and still didn't make the cut. And here lies the other problem with these 'mandatory' sessions - if the organizers said they'd be there for 20 minutes, why would they only stay for 10? It's a bit unfair to those who stayed in line for hours just for them. I would've thought that such details were covered in the regulations for these autograph sessions. If they're not, they should be. After all that, I decided to make a gamble. 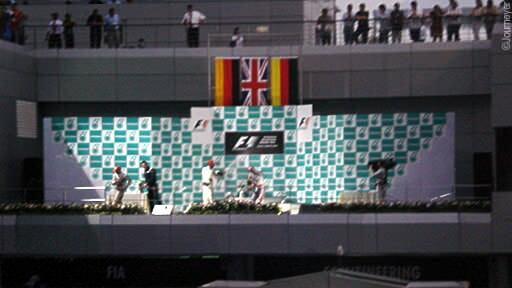 The Toyota drivers, Jarno and Timo, were next. Hearing that Brawn may have decided to have their session earlier than planned, I decided to skip Toyota, let those behind me past and wait for Brawn. Initially, the event security wouldn't let us, despite Friday's McLaren line. But we got some help - there was a Polish girl and a Japanese girl who, having missed Ferrari, wanted to see Brawn instead. We joined up and decided to do the same thing. There were also two Malaysian fans who joined us. The six of us just kept letting those behind us pass. After Jarno and Timo said their thank you's and goodbyes, the news came from the emcee - Red Bull and Brawn would have their session together! That meant we'd get four autographs in one go. Our gamble worked beautifully. 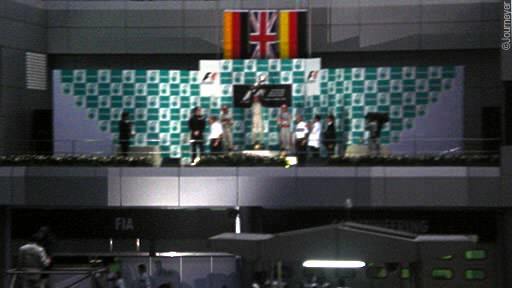 We even got a cameo in the form of Ralf Schumacher, who was on one side of the stage, happily doing work for RTL. It's F1 Racing's 2009 Season Preview - Brawn GP didn't even exist yet as it went to print. Button signing it was a nice touch, and it would be even better if he won the whole thing this year. Red Bull, meanwhile, was more downbeat. Mark and Der Seb had the 'I'd-rather-be-somewhere-else' look on their faces, and it showed. They were even hesitant to sign something other than their PR-provided driver cards. Not that it stopped my dad from insisting they sign our race programme, though. Event security were not amused. Free Practice 3 was next on the agenda, so we went to look for our seats. When we found them, we couldn't believe our luck. The view doesn't get much better than this. Just goes to show that, like Singapore, early booking reaps rewards. The break between FP3 and Qualifying gave us a chance to buy some food. This wasn't Singapore, where there were dozens of different well-known establishments selling food inside the venue. Here, the options were much more limited: 1 type of burger, 2 types of hotdogs, 2 types of satay, and fish & chips. The taste left much to be desired, but it filled our tummies just fine. Qualifying saw the same big names from Australia go for pole. It was a bit sad to see a lot of empty seats - there was no one to our left, right or front. But there were bigger things to consider; we were on tenterhooks due to the possibility of rain - which never came. After Button seized pole, it was time to go home. We decided to take the circuit bus back to the front of the circuit. It was a big mistake. First, there was no line to get on the bus - it was every man for himself. The bus driver also got mad for some reason we couldn't understand. He got so mad, he decided to just pick up sticks and leave - even if his bus wasn't full yet. He took the bus round the back of the circuit, which we didn't expect - it was different from what happened on Friday. The traffic was bad at the back of the circuit. And just to make things worse, the heavens opened. At this point, Sepang's organization just went belly-up. When we got out of the circuit bus, there were just a few, small, leaky tents to protect people from the monsoon. We even lost contact with our friends due to the chaos in the tents. Eventually, we saw them crossing the highway back to the shuttle bus. We followed them - and duly got wet. The highway crossing wasn't covered, so everyone who wanted to get out of the circuit got drenched. Eventually, we got in line for the shuttle bus. There were tents provided for the queue, but the organizers didn't want to use them, leaving us outside the tents in the rain. Common sense eventually prevailed and they let us in. But we saw why they didn't want us to at first: the grass underneath the tent had turned to mud. Some foreigners took the opportunity to get photographed barefoot on the mud. We braved the mud and got on the bus eventually. The rest of the trip was uneventful, but I got home completely exhausted. Sleep came quickly. We knew that we were in for an awesome race. We took an early lunch, then got on the train to Sepang - and duly ran into a deluge. It was nice to see the British weather making an appearance in a Commonwealth country. This was noon, remember, so the rain was earlier than usual. My initial thought was that the rain came too early - with the heavens having opened already, we were probably going to get little to no rain for the race. The rain finally stopped when we got off the shuttle bus outside the circuit. We managed to get to our seats relatively dry - even if we had to avoid a lot of puddles. Now back in our seats, we were in for a bit of luck again. There were leaks of rainwater falling on the seats to our front and right. As it was, we were safe and dry - for the moment, anyway. 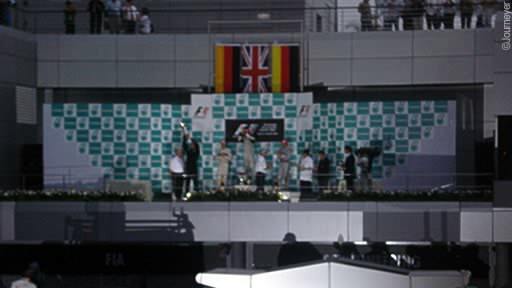 While the drivers were making their way round the circuit, the starting grid presentation began. Everyone took pictures of the performers - until the drivers got back to the front straight. At which point, everyone looked away from them and started taking pictures of the drivers again. Thankfully, the presentation wasn't done yet after the drivers went back into the paddock. It would've been a bit embarrassing for the performers if they finished without us looking. Yes, my favourite and Mr C's sworn enemy was on the grid - and for quite a while too. He had a good long look at Brawn's trick diffuser as well, trying to figure it out himself. This picture was taken as he was watching the cars go off on their formation lap. The excitement in the crowd was amazing as the race got under way. Nico's start was unbelievable - he was already alongside Button within 10 yards of the line. We were stunned - and then we got even more stunned as Kubica wheezed his way off the line. Kubica's eventual retirement came as no surprise after that start. As the race settled down somewhat, the Kangaroo TV helped us keep track of who to watch for as they entered the front straight. Those we had to keep an eye on a lot were Webber (who was either passing others or being passed), Alonso (who was racy even with an ear infection) and Hamilton. But again, we were on tenterhooks - would it rain? It took forever, but when the heavens opened, everyone got soaked - even us! The rain had a certain charm to it though - the cars looked beautiful throwing up spray (a shame I never got to take a shot of that). The water leaking through the stands, as well as the fading light gave this shot an artistic feel to it. As the race got red-flagged, we all wondered: would it get restarted, even if only under a Safety Car to get to the 3/4ths distance? The rain never wavered, and time was running out. By 6:30 PM, there was no sign of the race resuming - and by that point, I doubted we'd still see a restart. To pass the time, FOM treated us to Kimi getting an ice cream and some cola, as well as some Europeans sliding down the hillside. It made us in the stands cheer them on, but it didn't make a restart any more likely. They soon left the podium, and just like that, it was done. So what if the race just lasted for an hour and change? This weekend had excitement stamped all over it - it even beat Singapore in terms of action. But the organization left a lot to be desired - we had to go through even more mud just to get home on Sunday night. 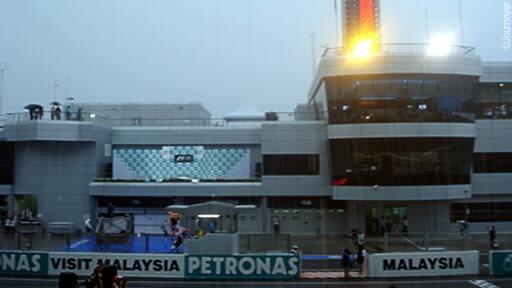 Sepang has the basic elements to create a good race - solid layout, changeable weather, long straights. But for a Tilke-drome and, in the words of Eddie Jordan, a 'circuit for the new millennium', it lacks a lot of basic features - like a covered walk and a proper bus shed. 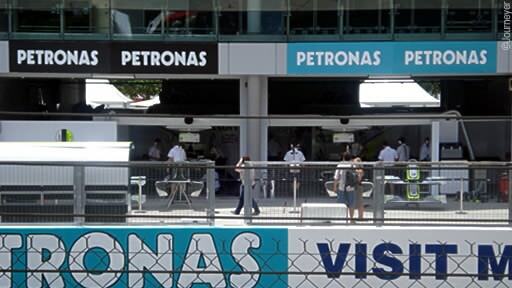 How can it expect to properly host an F1 race without these structures? For a place that sees a lot of rain, you'd have hoped they'd thought of that already. And it's in this aspect where Singapore is miles ahead, even if they've only hosted one race. Would I recommend this race as one to watch in person? Absolutely - it's one of the cheapest races on the calendar, and we had tons of fun. But for the organizers, there is definitely lots of room for improvement.